HONG KONG (Reuters) - "Transformers: Age of Extinction" will debut in Hong Kong cinemas on Thursday, where audiences are waiting to see giant shape shifting aliens try to destroy their city. The film, the fourth based on the Transformers franchise, is expected to become one of the highest-grossing movies of 2014, with the three prior films generating $2.7 billion in ticket sales at global box offices. The series performed particularly well in China, which is now the world's second-largest film market, and Paramount Pictures took steps to appeal to Chinese audiences with its latest installment. Filming took place in Hong Kong and three mainland cities including scenes at the Great Wall. Chinese actress Li Bingbing was cast in the film, and four smaller parts were filled by actors chosen from a Chinese TV reality show. Last Thursday, the blockbuster had its grand global premiere in Hong Kong, the first Hollywood movie to do so in this Asian financial hub. Director Michael Bay and his star-studded cast, including Mark Wahlberg, Kelsey Grammer and Stanley Tucci, braved a short torrential downpour to walk the red carpet. 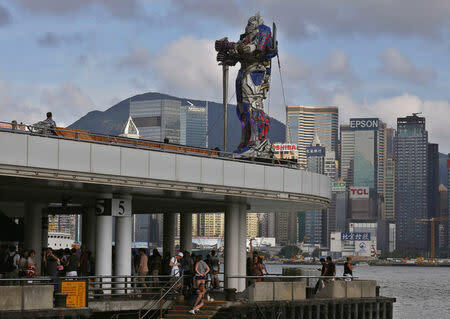 After that, they went to Shanghai, where "Transformers 4" was chosen to close a local film festival. "Ensuring we have the best movie for Asia and for China is definitely part of the strategy," said Rob Moore, vice chairman of Paramount Pictures. A day after its debut in Hong Kong, the movie will be released worldwide. Moore said he hopes box office receipts for "Transformers 4" in China will exceed the $165 million earned by their 2011 installment "Dark of the Moon." In the United States and Canada, "Age of Extinction" is expected to bring in $265 million during its theatrical run, according to a projection from Boxoffice.com. Paramount spent more than $200 million to make the film. New IMAX technologies were used to create the human and Transformer worlds in the action-packed movie. "You know Michael makes it as realistic as possible, so it’s the largest form of making pretend, but with the most bells and whistles around you," said actor Wahlberg. During shooting in Hong Kong last October, director Bay was attacked by two brothers demanding money. One of them even confronted him with an air conditioner unit. In the movie, an evil CIA assassin is killed with a falling air conditioning unit, which Bay said was just a coincidence. Working in China also caused some other headaches for the filmmakers. Last week, a Chinese sponsor demanded edits to "Age of Extinction" after it said Paramount failed to fulfill its contract to feature the company's building in the movie. On Monday, a Paramount spokeswoman said the issues had been resolved without any edits to the film.